Water damage to your home is not something that any resident wants to deal with, but it is an unfortunate reality. It is imperative that you know what to do in this situation. The first step is to inspect your home and try to find out where the water originated. From there, you will want to try and stop the leak if you can. If you can’t, just start by calling the professionals at Service Restoration of Alabama. We are the licensed pros that can help you in your time of need! Here at SR of Alabama, we have years of experience and the proper equipment and manpower to restore your property in no time! The first thing that we do when we arrive to your location is a full walkthrough and assessment of the damage. If there is still water leaking, we will fix that immediately, and then come up with a plan of action. Once we have walked through the plan with you and you have signed off, we will begin the extraction and drying process. It is extremely important that this be done by professionals such as Service Restoration of Alabama, because if it isn’t, you run the risk of your property being exposed to more damage. If the water isn’t completely dried out, it can lead to structural damage of wooden beams and drywall, and can also create the perfect habitat for mold to grow and thrive. 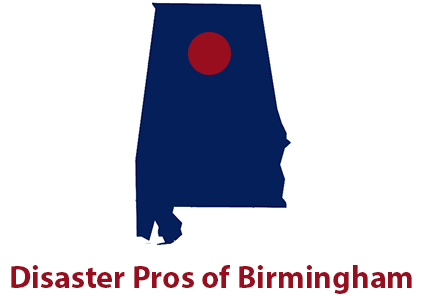 You can rest assured that when you call Service Pros of Alabama that you are receiving the best possible service. Our technicians are IICRC certified, meaning that they are up-to-date on the latest industry and safety standards. We also have an impressive array of innovative equipment including: hygrometers, moisture readers, injectidry systems, air movers, air scrubbers, industrial grade fans, and more. Here at Service Restoration of Alabama, we want to provide you with the best service possible. That is why we will have a representative that is available for you at all times, and can answer any questions or concerns that may arise through this process. For us, the job is not finished until you are completely satisfied. If you need water damage restoration, structural drying, or a consultation, reach out to Service Restoration of Alabama today! We are available 24 hours a day, 7 days a week, and 365 days a year for your broken pipes, leaky plumbing, or general water damage issues.